The first thing active Wellingtonians do immediately upon wakening in the morning is to listen. "Is the wind coming from the North or the South and at how many knotts?" The next action is to draw the curtains and look outside. "Is it raining?" What is not so easily answered for the outdoorsy type is, "When and how long and hard is it going to rain?" If you are a sports person in Wellington, your training has to be shoehorned into the spaces between the weather bombs. Get this wrong in the Wellington Region and it could even cost you your life! 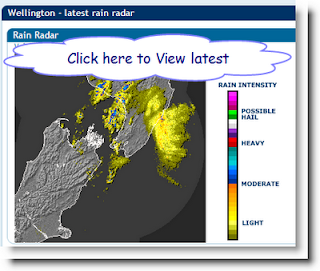 One of the most useful technological devices for figuring out when and where to go cycling/running/paddling and so on is the Metservice Weather Radar which gives hourly updates of what is coming our way. Check it out now by clcking on the image to the right. I remember the day of the OUtdoor pursuits tragedy, I was receiving numerous weather warnings for the north island by email, this service could have saved those lives had it been used by the pursuits centre.